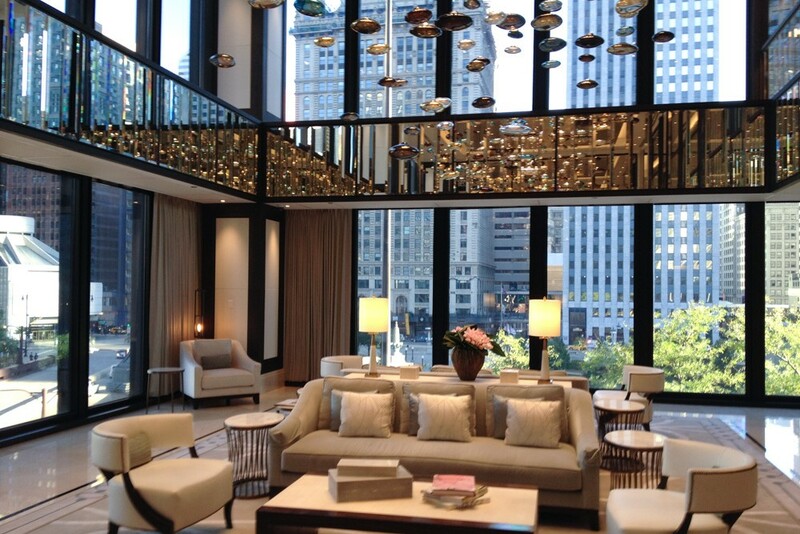 The Langham Hotel occupies the first 13 floors of the historic landmark, IBM Building designed by Mies van der Rohe. 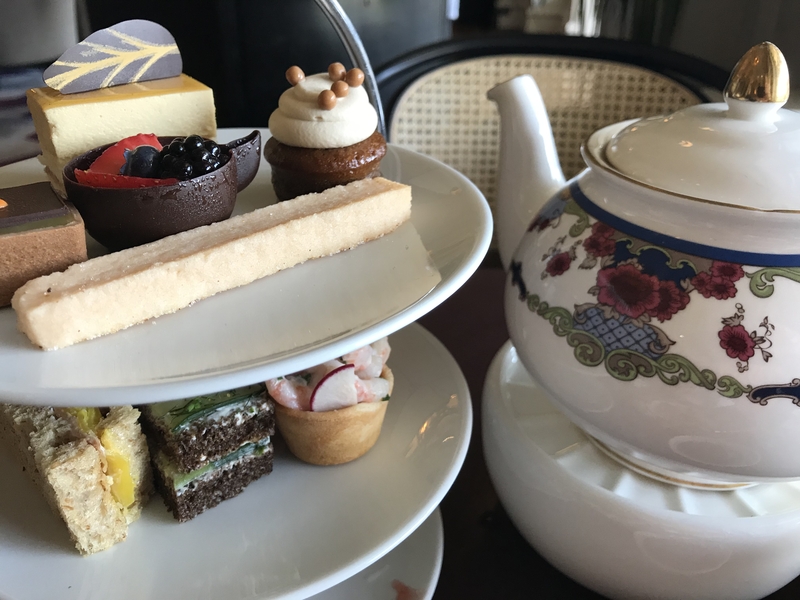 The Pavilion and their Afternoon Tea With Wedgwood is a lovely spot for afternoon tea overlooking the skyline of Chicago. Make sure to book ahead as it is very popular. Palm Court Drake: A well-known Chicago institution is the famous Drake Hotel at 121 E. Walton. 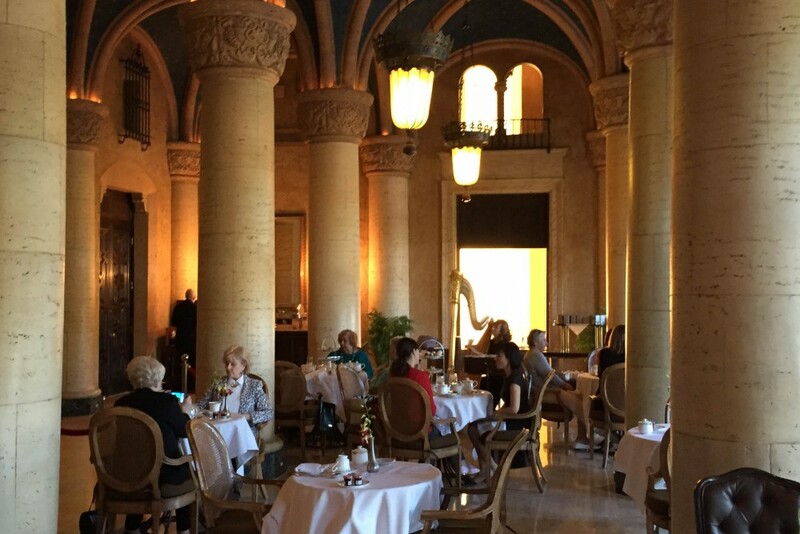 Here you can enjoy afternoon tea in the elegant Palm Court, which also features jazz and music on weekend nights. 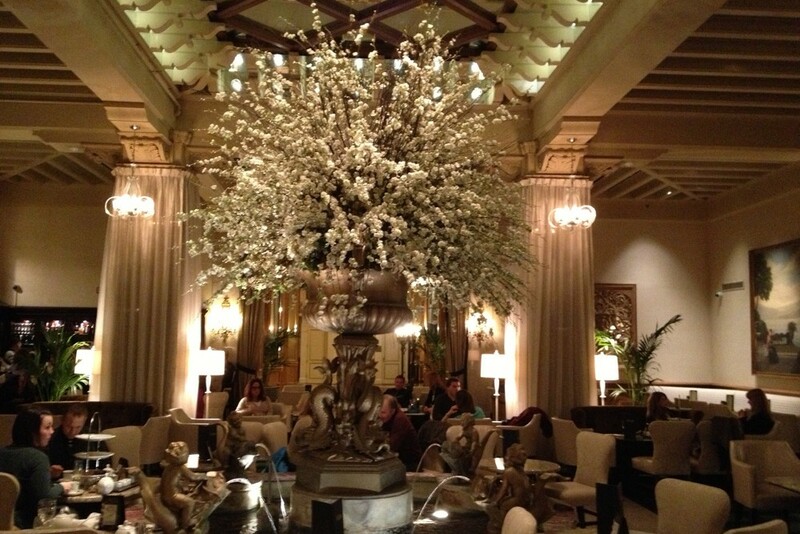 I have always liked The Lobby at the Peninsula Hotel for their elegant afternoon tea. They offer a full tea with pastries, scones and sandwiches or you can order a la carte. I just had a pot of tea and a plate of lovely pastries, which was just perfect for me! The lobby is really lovely and it overlooks the outside restaurant below. I just went to Lake Forest, IL on the North Shore in suburban Chicago to have afternoon tea at the award winning Deerpath Inn. It has been opened for over 75 years. 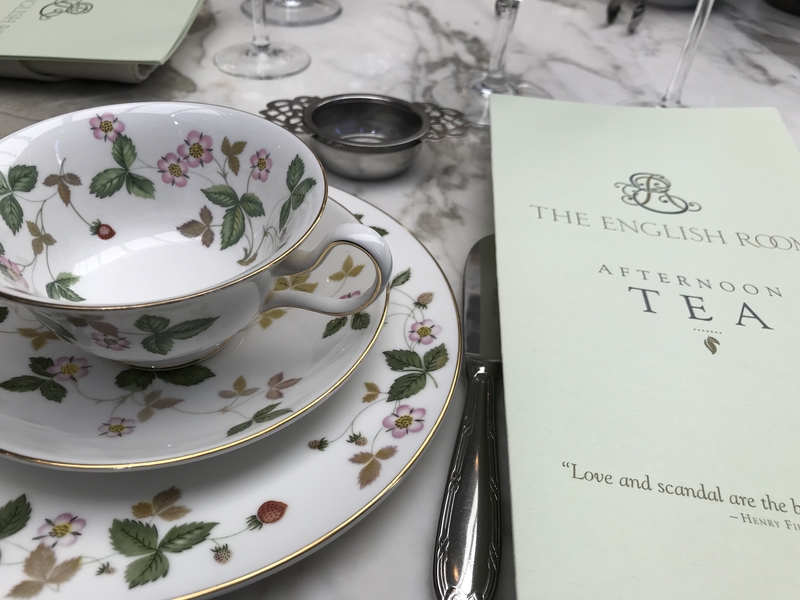 I loved being in the Garden Room of the English Room enjoying a great selection of teas along with scones, small sandwiches, tiny quiches, pastries and cookies. 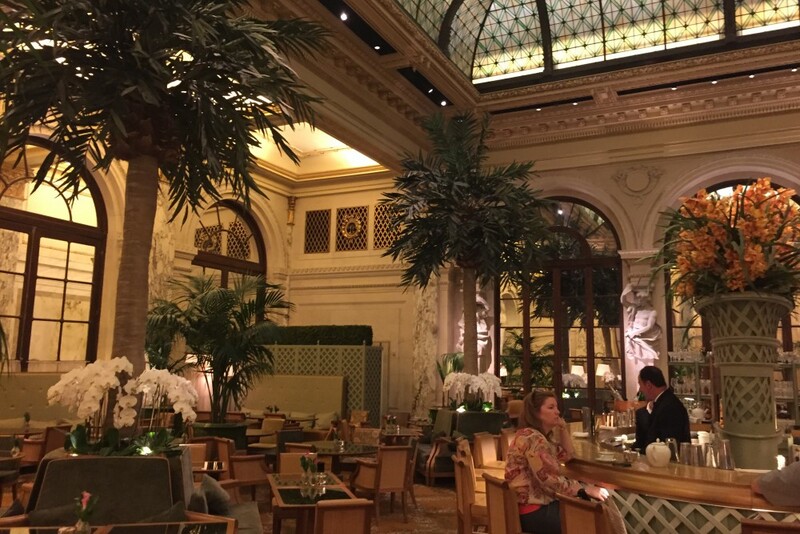 Plaza Hotel Palm Court: A great option for afternoon tea is The Palm Court. A famous tradition at the Plaza Hotel since 1907, this is the place for the famous afternoon tea. Breakfast and lunch are also served. Fifth Avenue and Central Park South. Russian Tea Room: A New York institution for over 87 years, this has been the place “where actors, writers, politicians, and executives plan their next deals and celebrate their friends’ latest Carnegie Hall performances.” Its elegant, modernist Russian style was recently renovated and a perfect location for lunch, afternoon tea, dinner or a pre-theater and post-theater dinner. 250 E. 57th near Carnegie Hall. 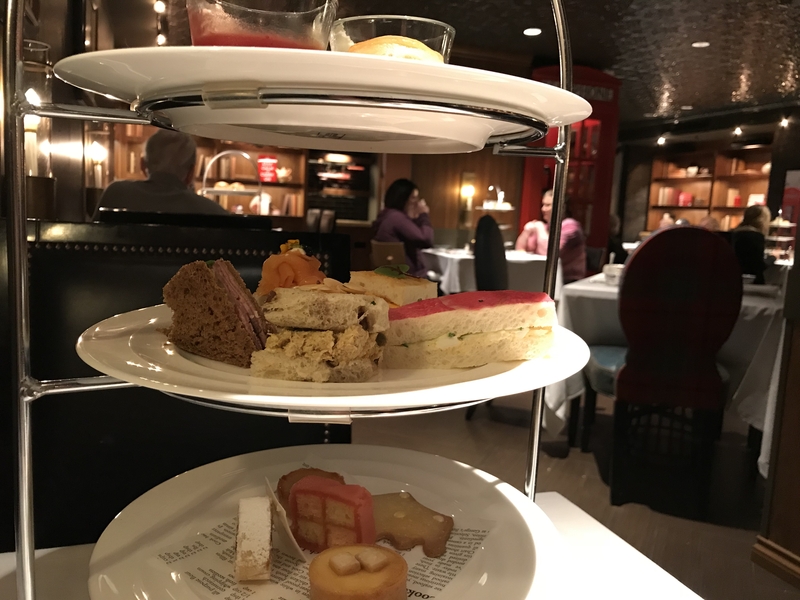 Afternoon Tea at the Jefferson Hotel: This traditional high tea is served in the beautiful lobby of this classic hotel under the statue of Thomas Jefferson. 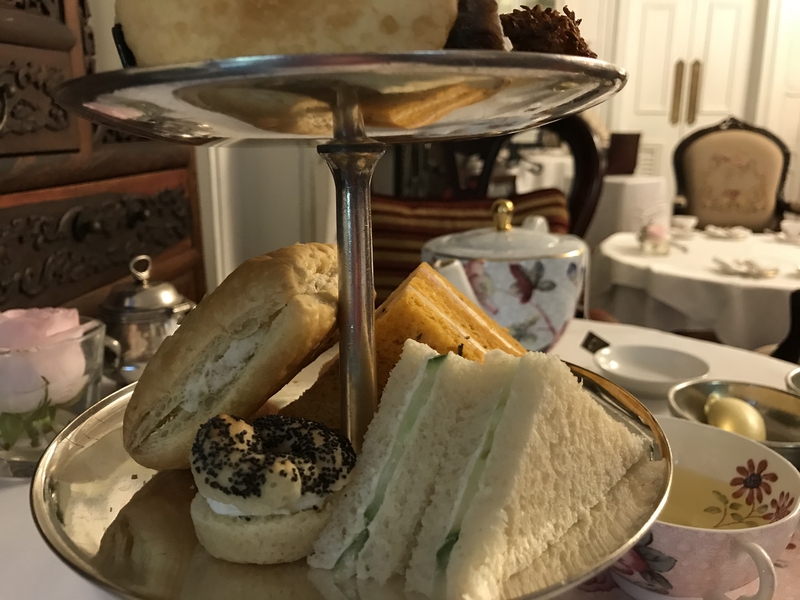 Not only did they feature classic sandwiches, breads and scones, as it was the third Saturday of the month, I enjoyed the chocolate tea which included additional chocolate items from small chocolates, chocolate mousse, chocolate covered strawberries and more. 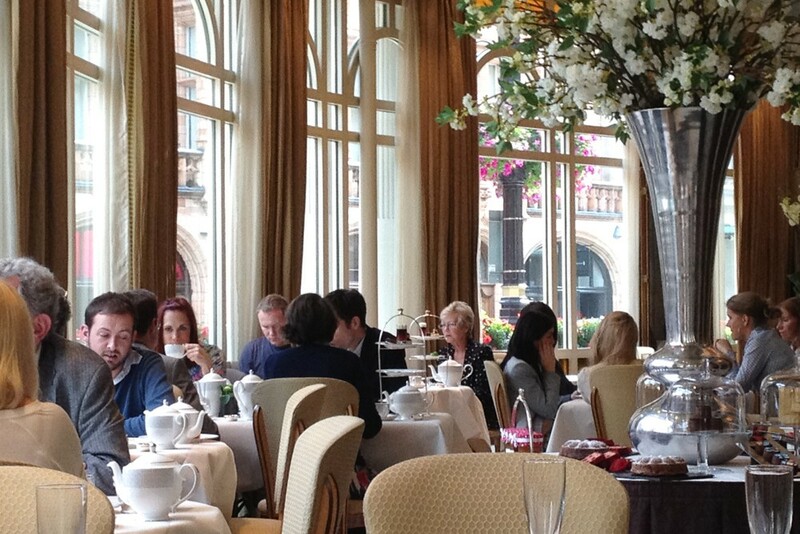 101 W. Franklin St.
Connaught Hotel: My favorite tea in London is by far at the The Connaught. At 16 Carlos Place in Mayfair, I had tea there again recently at the Espelette Restaurant, 40+ years after having my first high tea there with my parents in 1972. It is a wonderful, elegant hotel with great bar and restaurant. Laduree Dublin: Located on the corner of Wicklow and S. William Streets, this branch of the famed Parisian patisserie is known for its wonderful macarons. You can also get coffee or enjoy afternoon tea. The salted caramel macarons are my favorite. 1-3 S. William St.
Merrion Hotel: The Merrion is great for afternoon tea in the Georgian Drawing Rooms. Known as their Art Tea, it highlights some of their extensive art collection in three of the cakes served at the end. Make sure to book early online. 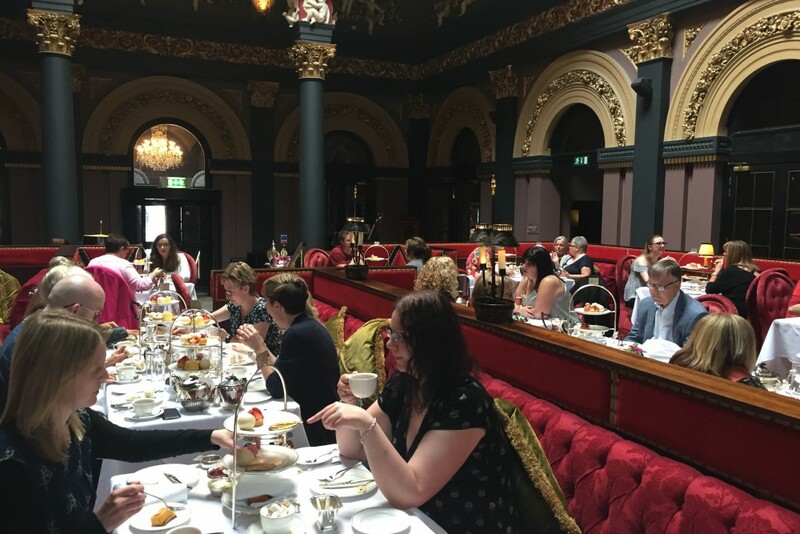 The Merchant Hotel: Make sure to add the afternoon tea at the Merchant Hotel to your list when you are in town. 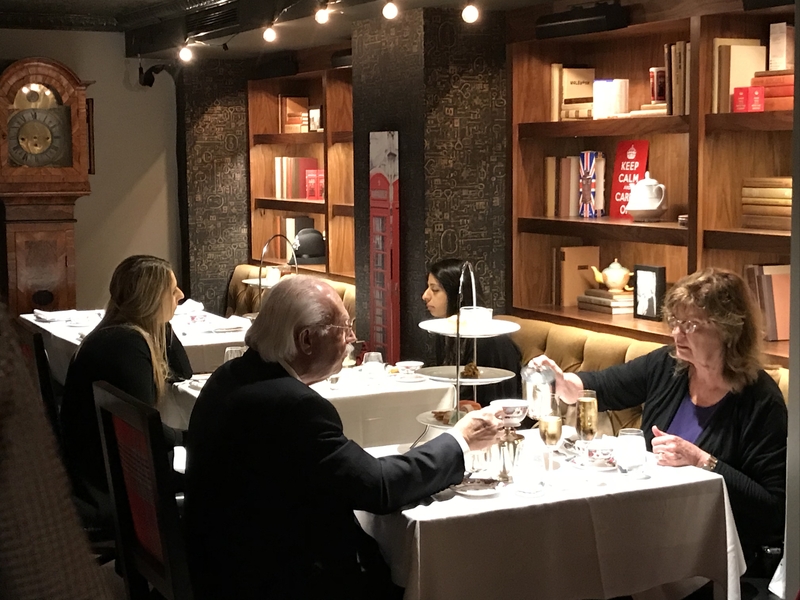 It is served in their stunning Great Room Restaurant. 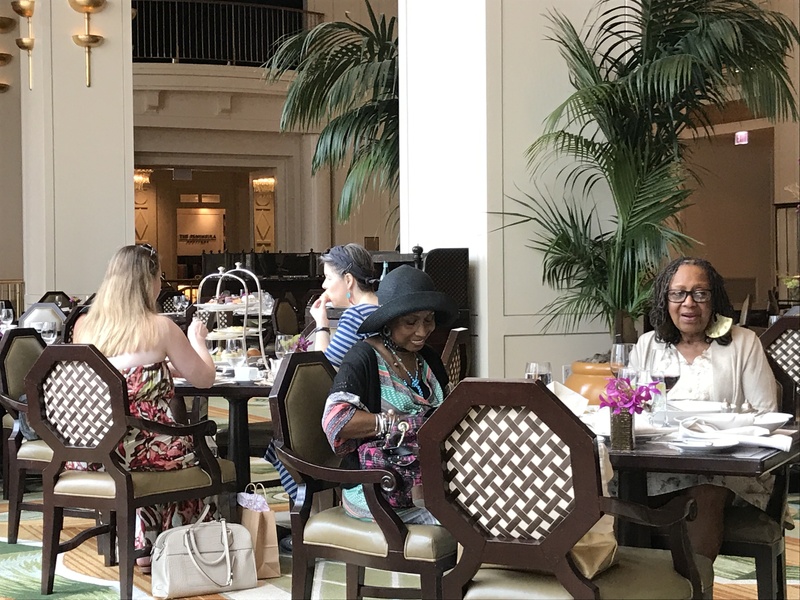 16 Skipper St.
Biltmore Hotel: Located in Coral Gables, I enjoyed a lovely afternoon tea in the lobby of this elegant hotel with the sounds of a harpist. It was a fun way to explore “Classic Florida” at its best. 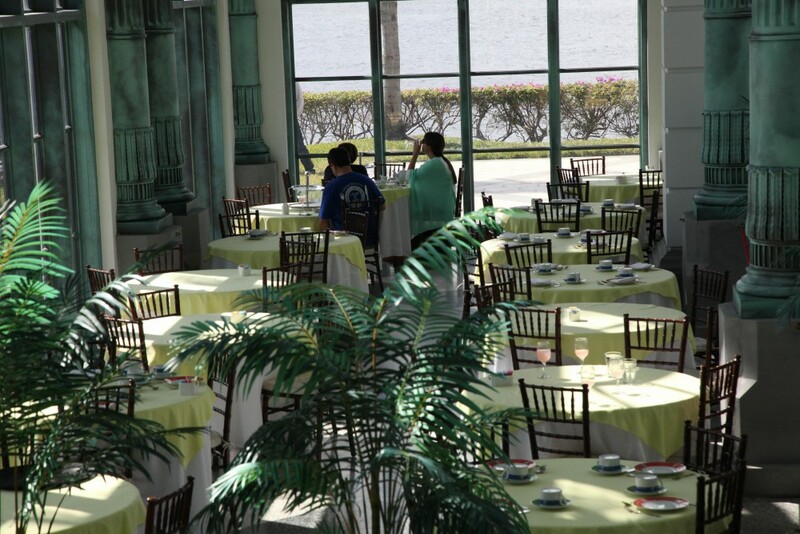 The Flagler Museum: After a tour of the famed Breakers, built in 1925, you might enjoy lunch or afternoon tea in the Flagler Museum’s Cafe Des Beaux-Arts. Peninsula Hotel: It is located in Tsim Sha Tsui, Kowloon and is the flagship property of the The Peninsula Hotels group. It has been offering luxury to travelers since 1928. You will love the traditional decor while enjoying afternoon tea in the lobby. 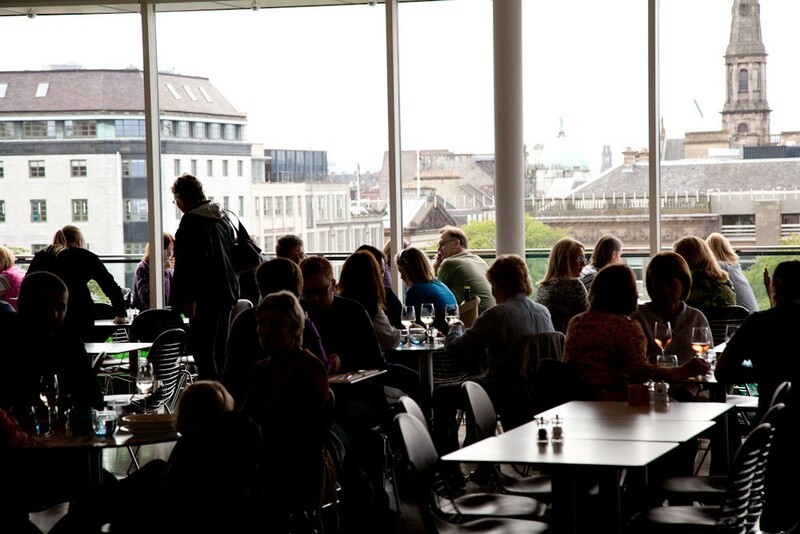 Harvey Nichols: Located at 34 St. Andrews Square, there is a sleek, contemporary bar and restaurant on the 4th floor of the famed department store. It has wonderful views of the city and is a perfect spot for afternoon tea. 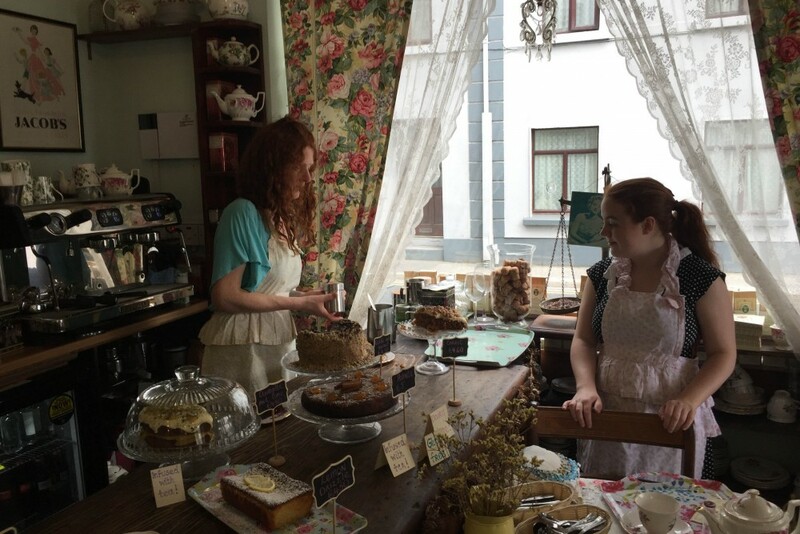 Cupan Tae, 8 Quay Lane, Latin Quarter: This is a charming Irish tea shop offering teas, breakfast, lunch and afternoon tea. I enjoyed an afternoon tea while exploring the city. Fowey – The Dwelling House, at 6 Fore St., is the perfect spot for a Cornish Cream Tea featuring their homemade scones. 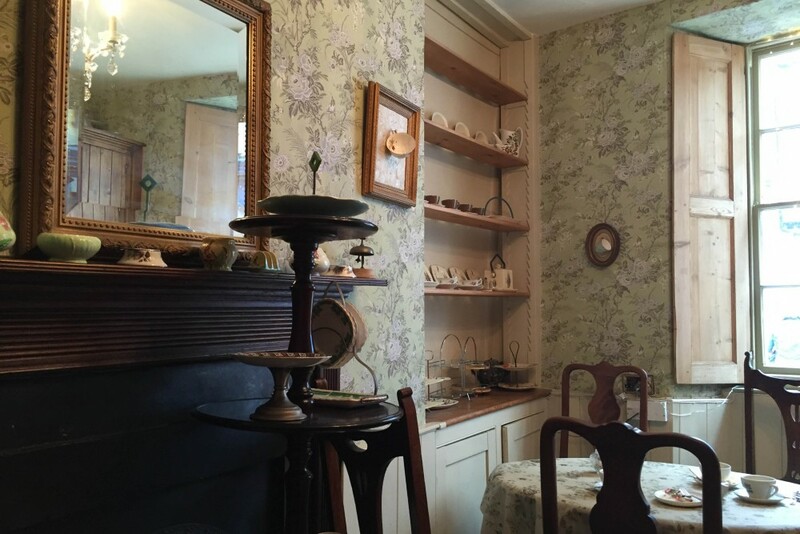 It is a charming B&B with two tea rooms on the lower level. 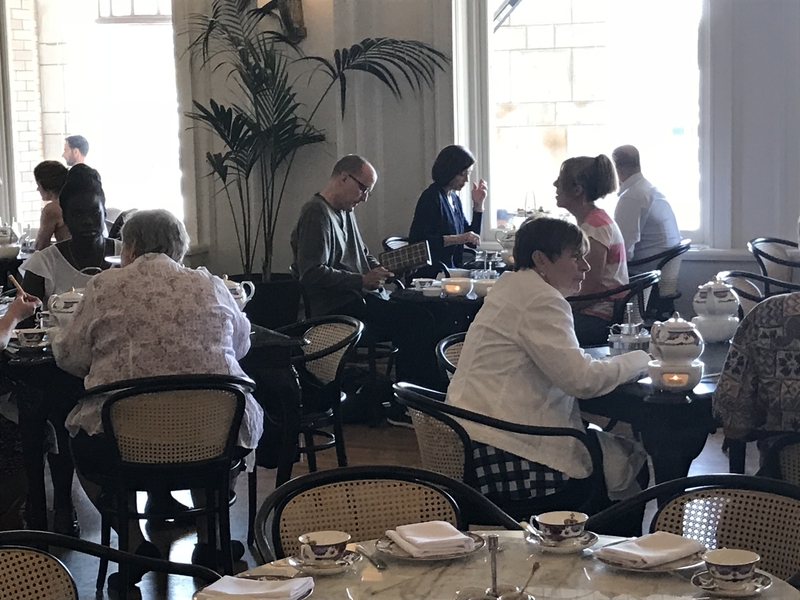 Mackintosh at the Willow: Don’t miss afternoon tea at the Willow Tea Room which is now known as Mackintosh at the Willow. I booked my reservation months in advance for tea, at the 217 Sauchiehall St. location, just to make sure I had a chance to see this famous building designed by Charles Rennie Mackintosh. I was fortunate to be in the deluxe room upstairs with many of his original details, including stained glass. He is known for his tea rooms where he designed the furniture as well. Ask to go upstairs to the room where you can see more of his architectural details and a great fireplace. 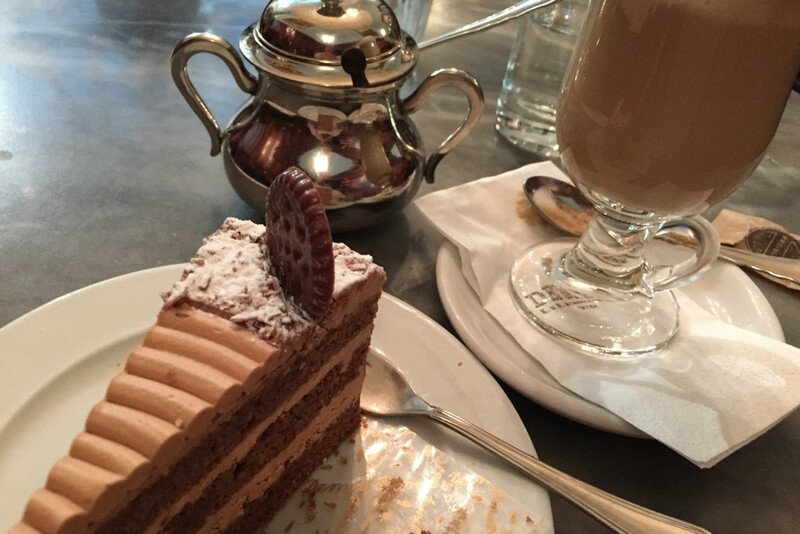 Demel: A trip to Vienna would not be complete without a visit to Demel. 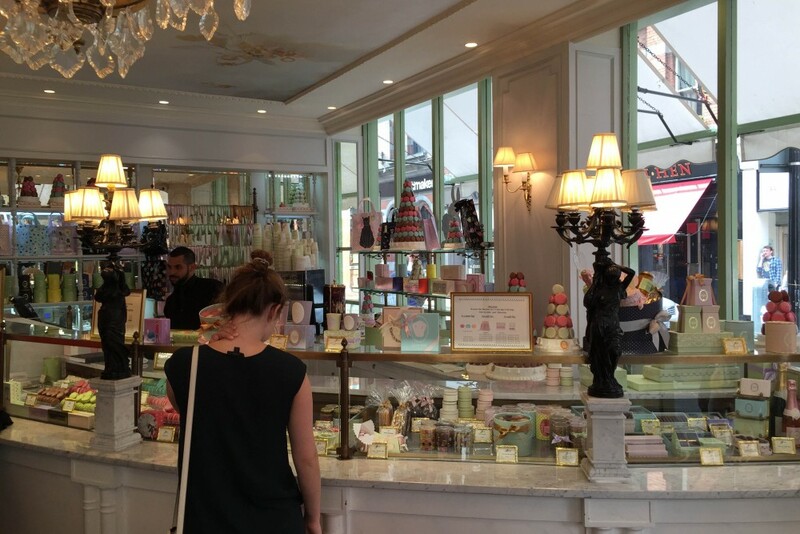 This is a famous pastry shop and cafe, from 1786, known for its wonderful cakes and chocolates. They do offer breakfast, small sandwiches and other entrees. They have wonderful coffees, teas and hot chocolates as well. The Mandarin Oriental is now the Waldorf Astoria Las Vegas. This five-star luxury property has some great dining options. 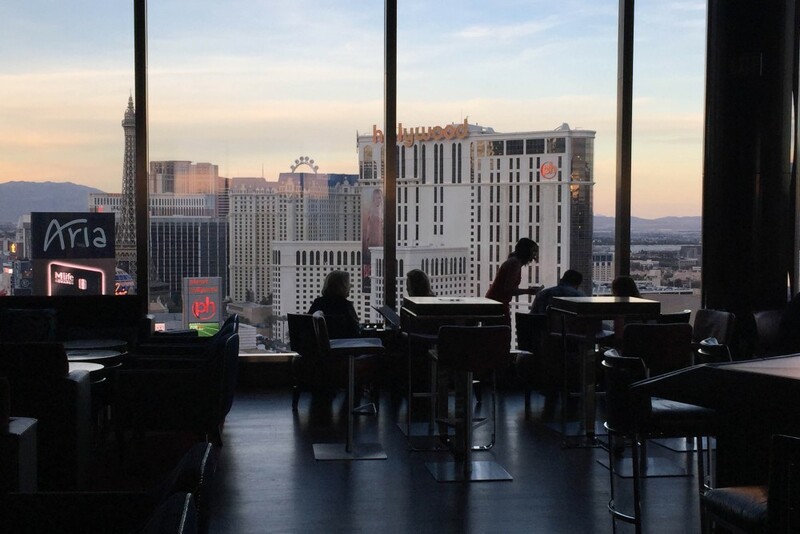 The 23rd floor Tea Lounge is perfect for afternoon tea overlooking The Strip. I highly recommend the experience. One of my favorite areas in Philadelphia, is Rittenhouse Square. 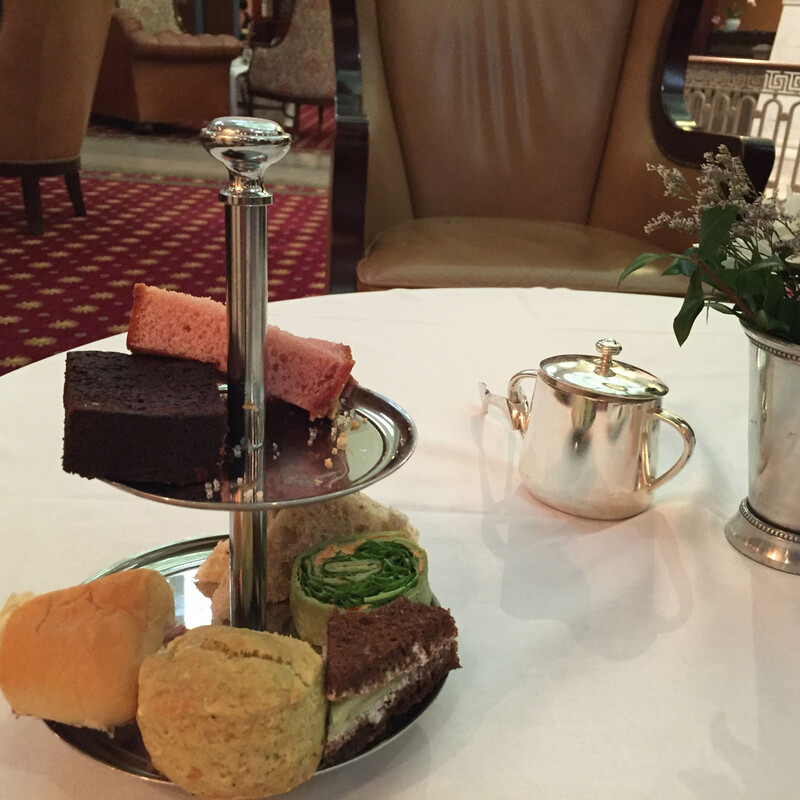 A great place for an elegant high tea, is the Mary Cassatt Tea Room at the Rittenhouse Hotel. Tea is served daily from 2pm to 5pm daily. 210 West Rittenhouse Square. 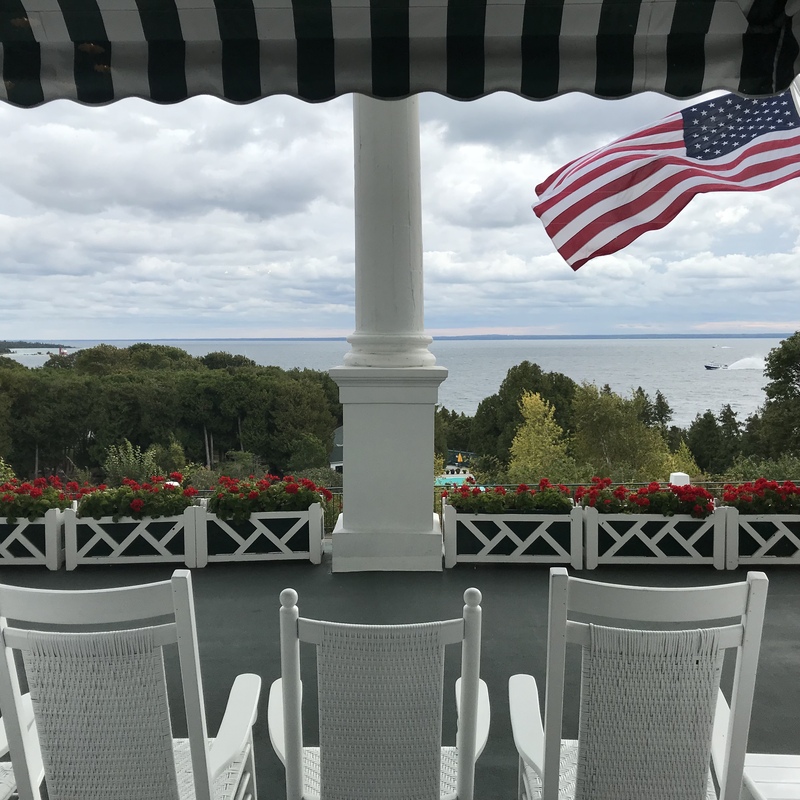 One my favorite places to visit in Northern Michigan is Mackinac Island. It is right out of the past with Victorian homes and no cars allowed. Therefore you can walk, take a horse drawn carriage or ride a bike. The Grand Hotel is one of the most elegant places in the US that opened in 1887. It became a summer destination for vacationers from Chicago, Detroit and other Midwest cities. 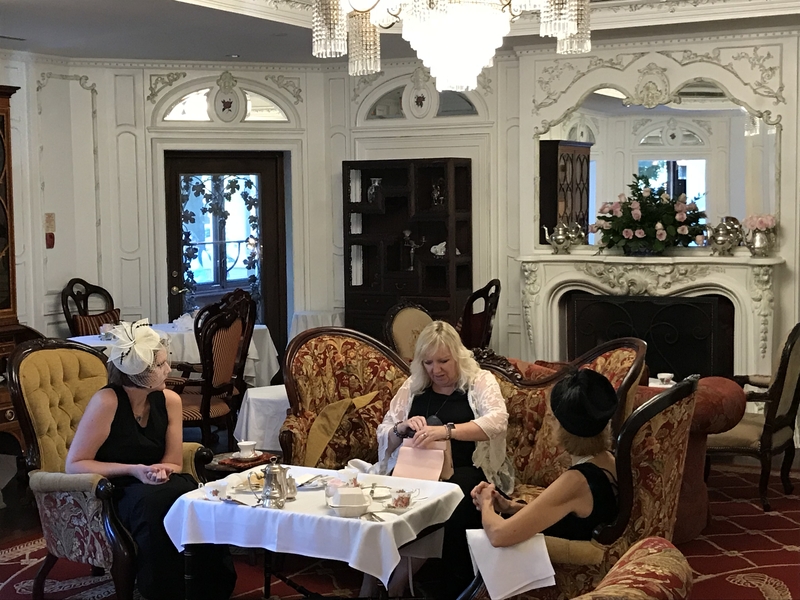 I highly recommend enjoying an afternoon tea in the Parlor from 3:30 pm to 5:00 pm, with live music, which has been a tradition for over 100 years. 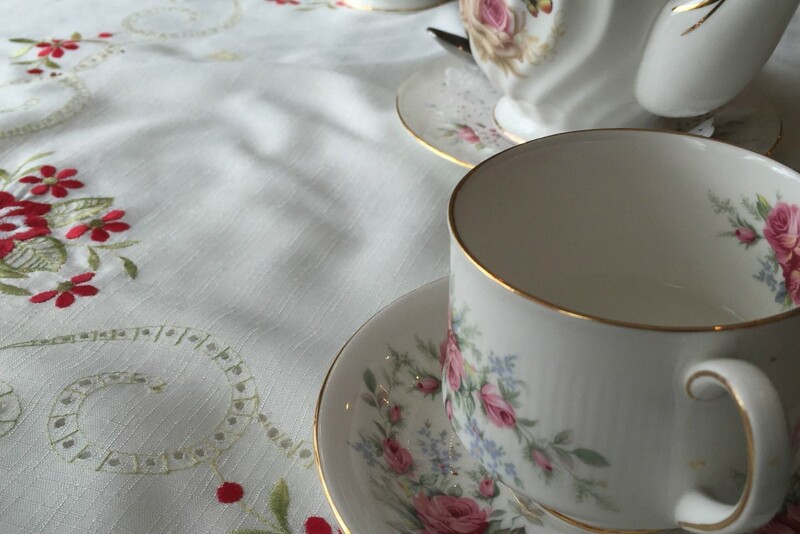 The price includes tea, sherry or champagne, a plate of finger sandwiches and another plate of lovely desserts. In the high season there may be a $10 admission fee for non-hotel guests. 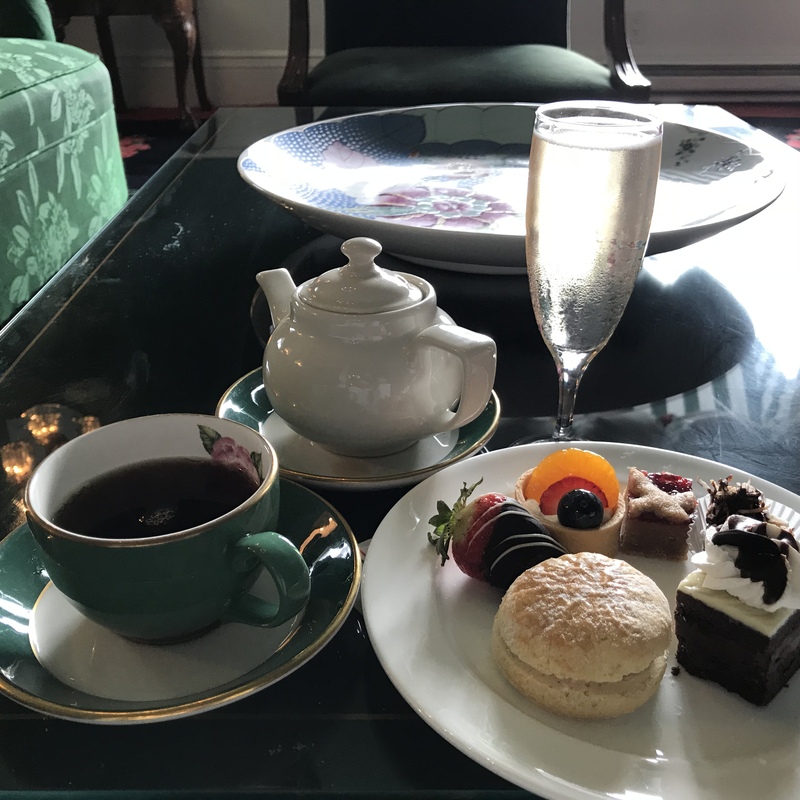 Tea at the Fairmont Empress: My favorite part of my trip was enjoying a traditional afternoon tea at the grand Fairmont Empress Hotel. 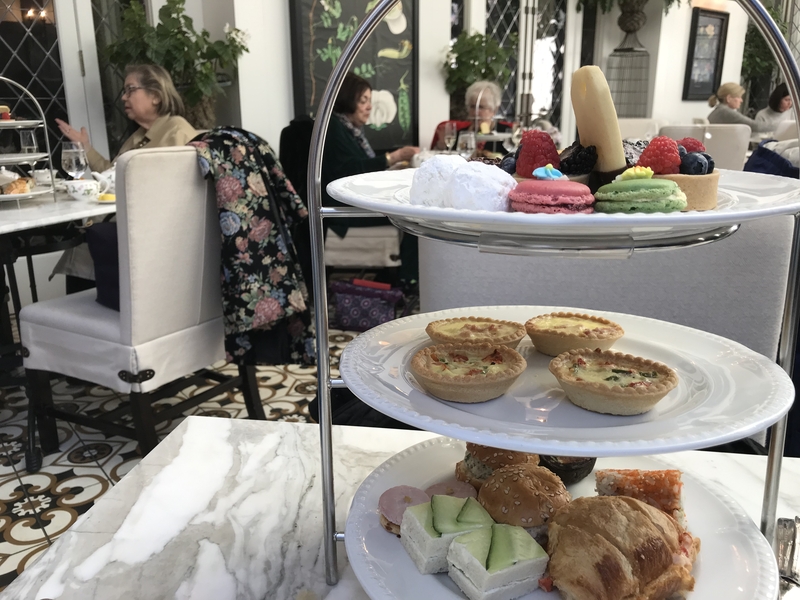 Set in their formal salon, the tea includes their house-made signature scones, pastries, clotted creams and strawberry preserves with fresh lavender from the rooftop herb garden. There are 21 loose leafs teas available to choose from. This is a must when you are in town. The hotel is really lovely as it recently underwent a two-year $40 million renovation. 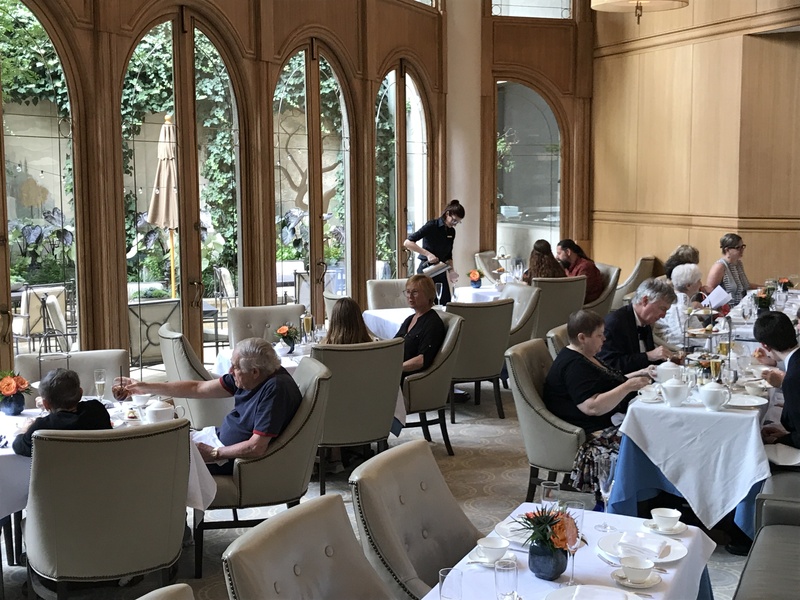 Afternoon Tea at the Fairmont Hotel Vancouver: The Fairmont downtown features a themed afternoon tea in the private dining room of its restaurant. When I was there, they were having The Great British Tea Party featuring scones, tea sandwiches and sweets. It is a fun experience that I highly recommend. 900 W. Georgia St. 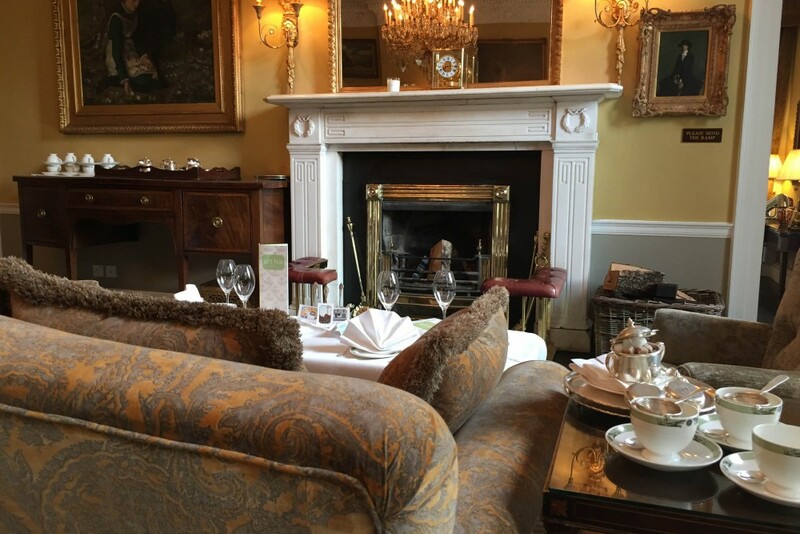 I also recommend enjoying an elegant afternoon tea in the Drawing Room at the historic Prince of Wales Hotel. 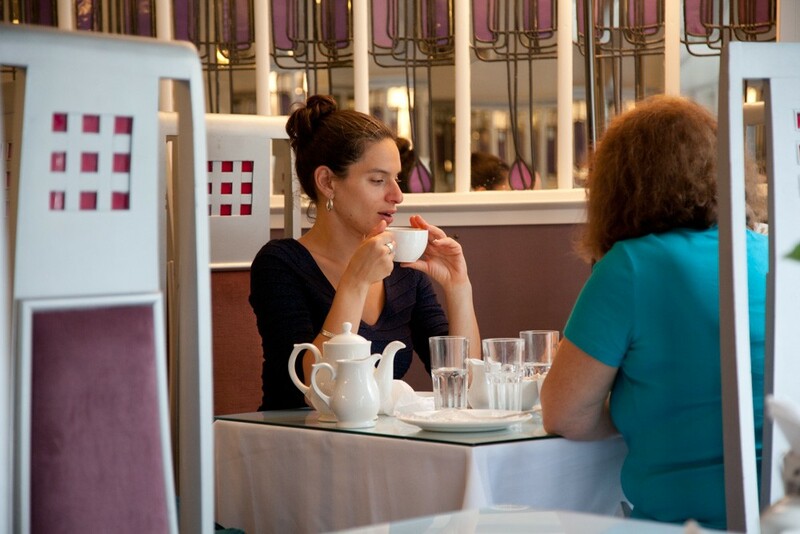 Here you can pick a choice of tea and enjoy a selection of pastries, sandwiches and scones. I went after a theater matinee and enjoyed seeing the historic building from 1864. It has has been the Prince of Wales Hotel since 1901. 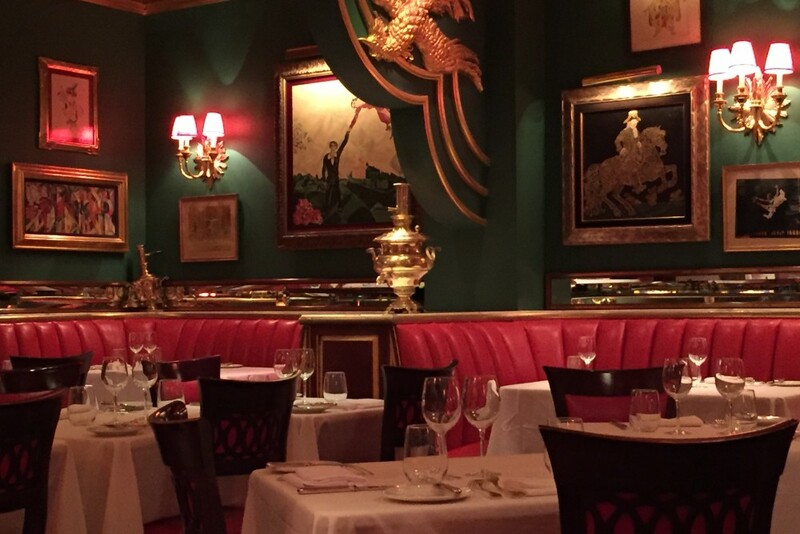 The Victorian Drawing Room is small so make sure to make your reservations online before you go.